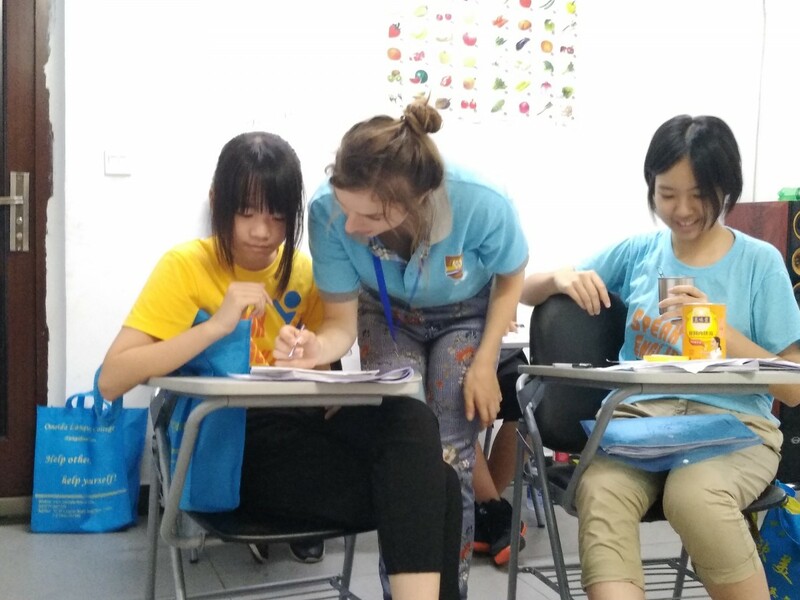 My name is Abbi Mayes and I have worked as an English teacher at Omeida for the past 4 weeks as part of a summer programme. I am originally from England but live in a country called Austria in the central of Europe and so I thought I would be acquainted with travelling and living abroad. However this could not prepare me for the Omeida experience. When I first arrived in China, the heat and the humidity was shocking. My lack of language knowledge was also a great fear. Nevertheless I was stunned by the kindness and welcoming nature of the Chinese people across China. Also Omeida was very useful in helping me organise my travel across China once I arrived. They have a very attentive and experienced team that was able to accommodate the needs of the teachers in many situations, even beyond a professional level. Omeida felt like a community. I spend my first two weeks working at the summer camp. Whilst there I was partnered up with another foreign teacher and together worked with a group of around 35 students. 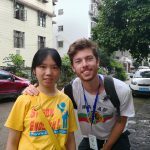 My foreign partner was an American girl and despite having no language barrier with her, I was able to learn a lot about her and her culture despite her being a Westerner and assumably similar to me. This was the case with many other foreign teachers as there were native English teachers from Australia, Canada and even South Africa who I worked with and was supported by during my time at Omeida. On top of this I was able to establish good relations and life long friends with different types of Chinese people. In each class you have a head teacher who assists with translation among other things. I found that they were incredibly friendly, as were the students. The students are so kind and hard working. Sometimes when you speak to them you forget how young they are as their ability and enthusiasm shines bright. The summer camp and school teaching were very different. At the camp it was a full day of combined teaching and activities as well as trips and excursions. There were also activities in the evening such as talent shows, BBQ’s and bamboo dancing which really helped to connect with the children. It was all very fun and lighthearted. At the school typically there are four lots of forty-five minutes of teaching, mostly in the morning but also in the afternoon. There were resources easily available and then teachers can teach independently to suit the needs of the students. It is easy to become close with the students and miss them greatly when you leave. 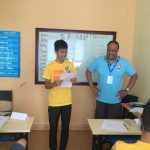 There are also opportunities at the school to help with evening activities as well as conversational classes which are extra and a good way to spend a relaxed time with the students. Between twelve and three each day there is a siesta. In this time you can plan classes as well as chill out. At the school you also have evenings and weekends free. This means it is possible to sightsee and do activities. You are able to buy or hire bikes that mean travelling is easy. You even have time to take trips to nearby cities. Yangshuo is such an incredibly beautiful place. The mountains here are like nothing you will see anywhere else. It is also good to experience the culture of local people around the town and try a lot of great food. The food is also good for being with special dietary needs which means it’s perfect for everyone. There is also the opportunity to learn Chinese. You can get matched with a language partner who you can exchange conversation with as often as you like. Everyone is also very encouraging to help you, especially the students! Luckily in my accommodation, I lived with an eighteen year old English student who I am now very good friends with and will continue to stay in contact with in the future. Overall Omeida has been a wonderful experience which I would recommend- there is always work available. Now it’s time to continue on and travel across more of China! 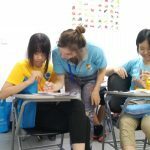 Next Article : English teaching jobs in China – Why you should teach English!